Ultra HD Blu-ray is here, and the Samsung UBD-K8500 is the cheapest way to join the resolution revolution. It's not just about resolution, however: the addition of HDR brings a visual treat. Combined, Ultra HD Blu-ray offers a premium movie experience, but for those interested in this first generation of device, there's a heavy price to pay. Optical discs are dead, or so many would have you believe. That's perhaps a reflection of the times we're living in, where streaming entertainment out-paces its arrival on physical media. What better example than the latest Star Wars blockbuster, arriving on digital platforms weeks before it hits the stores? Then we have 4K resolution, lauded as the next thing in home entertainment, arriving via Netflix and Amazon Prime Video long before Ultra HD Blu-ray (which caters for 4K output) was even available. That makes the challenge faced by Ultra HD Blu-ray greater than it was at the last throw of the dice; plus you'll need a decent 4K TV set if you don't already own one. The upgrade from DVD to Blu-ray was an easy decision, but with streaming options now cheap, plentiful and widely available, do we even need optical discs any more? Well, yes, if you love movies then you do. The Samsung UBD-K8500 is the most affordable 4K player on the market at the time of writing. But then with only Panasonic in contention the options are, like Ultra-HD Blu-ray discs themselves, not exactly plentiful. So if you're looking for the most affordable route into 4K Blu-ray then this Samsung is it. The most notable thing about the K8500's design is its curve. With Samsung now billing flat TVs as equally flagship as its curved ones, the player's bent design may just be a throwback to its original 2015 announcement and little more. Certainly, once this player is stacked in place with your other AV components, that curve is barely noticeable when looking at it front-on. It's a black box as all these things typically are, and apart from that curve and some angularity to the front, there's little else to comment on. This player is a standard 40mm wide and just like most Blu-ray players of recent times is only 230mm deep. The front of the player sees the disc drawer to the left, with touch controls on the top right, offering up the basics to control playback or eject the disc. Most other controls will fall to the included remote. Otherwise the front is fairly free from distractions, with only a small LED to reflect the status of the player. We've been spared glowing logos and all the rest of it - simple is best and it works well in this instance. There's a fan on the rear for cooling, which doesn't make more noise than any of the other devices we have connected to the TV - the loudest being the Xbox One power supply. 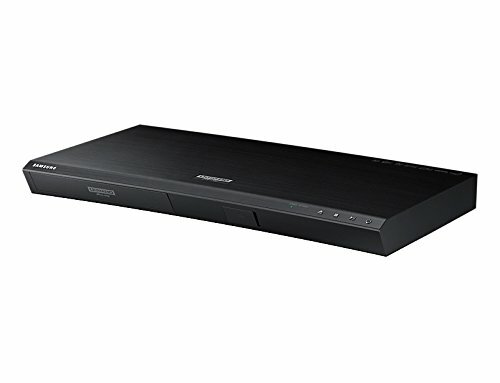 In terms of connectivity, the Samsung UBD-K8500 is the simpler of the two Ultra HD Blu-ray players on the market (at the time of writing), with Panasonic offering the more comprehensive selection of connections on its rival UB900 player. The Samsung features two HDMI ports, one for connection to your display, the second designed for audio. This is a convenient setup for those wanting to connect to an existing AV receiver or soundbar, without having to tackle the issue of whether passthrough is going to be a problem. Optical is also offered as an audio alternative, for those with legacy hardware. There's an Ethernet connection as well as Wi-Fi, meaning you can wire up for the online services the player also offers. If you've no plans to use the in-built apps, then Wi-Fi is fine for the online software check-ups that the player might want to do, but if you want to stream 4K content then we'd advise using Ethernet. There's a front USB port that will allow you to connect a drive, offering an easy method for watching content you might have downloaded, or captured yourself from a phone or camera. The positioning on the front of the player is convenient, as most TVs' USB ports are around the back, which is good for aesthetics, if not connectivity. As with most other Blu-ray players and peripherals, setup is straightforward. However, the important thing about setting up an Ultra HD Blu-ray player isn't just the player itself, but also on the display you're connecting it to. When connecting to your TV's HDMI you need to ensure the TV knows you're connecting an Ultra HD device and select "UHD HDMI Colour" or "HDMI Deep Colour" (different manufacturers use different names). This is the same process you'll have to go through with other Ultra HD/4K devices at the moment, as not all TVs automatically detect what has been connected. But if you don't turn it on, you won't get the wonderful colours you're expecting and things will look a little stripy. For the player itself there are a range of settings to govern video and audio. Within these settings you'll find options to set the output resolution, 3D, 24fps/cinema and so on. You can force things, or stick to Auto, according to your preferences. If you stick to Auto, then the player will output at the highest resolution it can for the material - that's 3840 x 2160 50p for a DVD and 3840 x 2160 60p for Blu-ray - and handle upscaling. If you choose to step-down the output resolution then the TV will handle any upscaling. In the settings you'll also find everything you want to manage audio, so you can select an output appropriate for the system you're connecting to, be that PCM, bitstream or re-encoded for DTS or Dolby Digital. Samsung has opted for a compact remote that's nice enough to grip, although we suspect the size will make it even easier to lose down the back of the sofa. If you're connected to a Samsung TV, you may find by using Anynet+ you'll have some control via your standard TV remote - although this is the slower option, as commands are passed from the TV back to the player. The K8500's homescreen has three main areas: the disc in the drive, as applicable; multi-media, which handles network storage or USB drives; and Samsung apps, which is where you go to download any apps you want from Samsung's smart TV platform, such as Netflix or Amazon video (there's little of much value outside those major subscription services). The overall user interface lacks the maturity of Samsung's Smart TVs, but we guess this is something of a grey area: you're likely to be linking this player to a sophisticated 4K TV, so the inclusion of these streaming services (offering 4K where available) may be an unnecessary addition. But if you've found yourself without Netflix 4K because it's not on your TV, then this player rectifies that. Ultra HD Blu-ray only exists for one major reason: to deliver an experience that surpasses Blu-ray and, ultimately, all those streaming services too. We've long been of the opinion that Blu-ray is superior to Full HD streaming, not only in consistency and solidity of the picture quality, but also the wider audio options you're potentially offered. Streaming might win out on convenience and price, but fire-up an Ultra HD Blu-ray and you're treated to that visual feast once again. Sure, Ultra HD Netflix offers up some lovely sharp images, but the depth that comes with Ultra HD Blu-ray will have you grinning from ear to ear. It delivers on that next-gen promise, with your 4K TV throwing out super-sharp visuals. There's just so much more data available from the disc version that be chanelled through that HDMI cable (HDMI 1.4 works fine at up to 30fps; HDMI 2.0 is what you'll want for 60fps and high dynamic range (HDR)). And it's HDR that plays a big part in elevating Ultra HD Blu-ray beyond just a pure resolution bump. It caters for a wider range of peak brightness and low black level, with some titles (but not all) utilising this added potential. We're fairly sure that HDR could be abused by some makers, just as 3D has been used to create some horrible films, but used right and the added pop it brings makes a huge difference. However, HDR is a varying experience based on how good your TV is, the size of it and the distance you're sitting from it. Overall, the combination of that resolution combined with the increased contrast and colour encased in HDR makes Ultra HD Blu-ray a premium experience compared to the flatter delivery of a streamed title. And that's what really matters. Having watched The Martian streamed via Google Play and Chromecast, the Ultra HD Blu-ray version of it felt like an entirely different filmic experience. However, Ultra HD Blu-ray is a new format, meaning it's more expensive and titles are limited, slowly being released as they get remastered by studios. It's likely that you'll be watching a lot of Blu-rays in the meantime. But these look excellent upscaled. We'd go as far as saying DVDs are still very watchable too, so all those old favourites are just as valid as they were before. We appreciate the added colour pop to Back to the Future on DVD: shaky titles only add to the 80s character. For all this good there is an important point to considered: the Ultra-HD Blu-ray experience is very much defined by your television. And if you don't have a 4K set yet then you'll need to invest in one wisely. We tested the K8500 with the 55-inch Samsung JS9000 and Samsung KS7000 televisions, both of which sit towards the top of Samsung's collection for 2015 and 2016 respectively. We also tested it using a more entry-level LG LED UHD TV, which is a quarter of the price of that top-end Samsung. On the cheaper display many of the benefits are lost. First of all, it lacks HDR support, which is a big part of the Ultra HD Blu-ray experience as we've discussed, but it also doesn't deliver on the detail or colour, regardless of the source. The point is that if you're planning to pair your Ultra HD Blu-ray player with a poor TV, you're not getting anywhere near the experience that you get from the best TVs. There are no real shortcuts here and we suspect that those interested in the very latest in home entertainment will already have, or be planning to buy, a great TV. If you were in any doubt about the relevance of optical media then rest assured: Ultra HD Blu-ray is stunning, offering a premium experience that surpasses other current options. For those seeking that next-gen visual experience, the Samsung UBD-K8500 is a solid choice. It's also more affordable than its main Panasonic rival, although lacks the range of connections that might see the Panasonic emerge as the more technically adept option. Of course, you'll need a 4K TV capable of doing Ultra-HD Blu-ray justice. And given the slender catalogue of titles available it might be worth waiting for more to become widely available and at prices you're willing to pay before taking the plunge. The future is Ultra HD Blu-ray and whether you invest now or bide your time, one thing is certain: there's no point in buying a premium Blu-ray player any more.